If you mix the indicators for the two types of trading style — trend-following and swing-trading — you may get confused. One may tell you to stay long when the other one says sell. One example of this is when a downtrending price becomes temporarily oversold and then bounces upward. You may engage in a little wishful thinking that you see a trend reversal, and you become a buyer of what you think is a new uptrend. To try to avoid making this mistake, you need to choose a core guiding principle, either trend-following or swing trading. Wait out retracements and sideways range-trading situations until they resolve back into a trend. Use information from momentum indicators to modify their positions — for instance, by taking some profit when the security becomes overbought or oversold, even though the trend is just pausing. They expect it to continue. 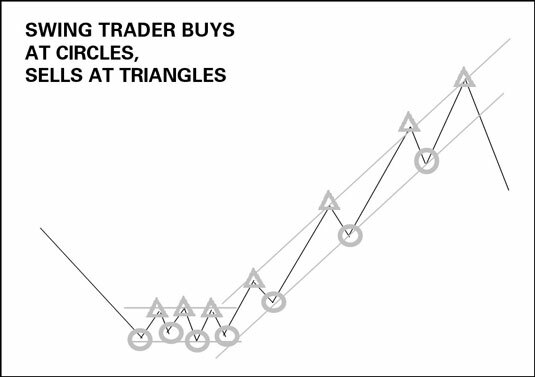 This figure illustrates a trend, complete with minor retracements, and shows how a trend-following trader makes decisions. 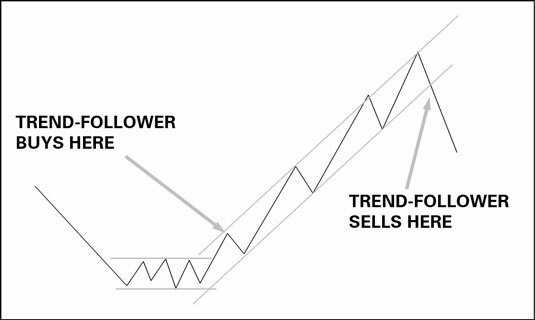 If you choose trend-following, you choose to suffer through the downward bounce in an uptrend (or the upward bounce in a downtrend). And if you have correctly identified the trend, your patience pays off when the trend resumes. Pro: Swing trading is more flexible than trend-following because you can apply the techniques under different market conditions. Con: Swing trading requires more frequent trading, and the profit on each leg of the trade tends to be smaller than in a single trend-following trade. A swing trader may know that a price is downtrending, for example, but he’s still willing to buy it for a short-term profit opportunity when a momentum indicator says it’s temporarily oversold and likely to enjoy a bounce upward. This figure shows how the swing trader tries to capture every move, including the retracements.